← DON’T MISS GOD’S ANSWER! WHAT IS THE BIG DEAL ABOUT THE “DAY OF WORSHIP”? OBSERVATION: What is the big deal about the “Day of Worship”? When you read the 10 commandments given to Moses in Exodus 20 it is worthy to note that the Third Commandment is the one that is expounded more than any other. Evidently God thought the “Day of Worship” was a big deal. And if it is a big deal to our Lord and Creator….then it should be a big deal to us! Some might say – “I can worship anytime and anyplace!” Yet, this commandment makes is very specific. God was calling His people to a solemn day of rest and worship. This was not a call for each individual to simply have a day off from work. This was a call for God’s people to gather together in a holy convocation to worship corporately as the people of God. How we view and treat this day speaks volumes to what place of importance the Lord has in our lives and in the lives of our families. As New Testament believers, the issue is not whether we observe Saturday or Sunday as the day of worship. The real issue is – do we honor the Lord by gathering together with His people, in a holy convocation, to worship Him? Do we set aside one day where the most important thing we do is honor the Lord, gather around His Word, and join in corporate worship? The Lord knows our tendency to simply drift away through business and distraction. It takes intentional obedience to honor the day or worship! Throughout my life I have always made Sunday the intentional day of worship for my family. This was not something I did as a pastor. This was something I did as a child of God. I used to leave home on Monday, travel around the country until I flew home on Friday. I only had two days to spend with my family. We only had these two quality days together before I hopped on a plane and did it all over again. And when I look back on those days, do you know what I remember? It is not the outings that we did on Saturday that I remember fondly. 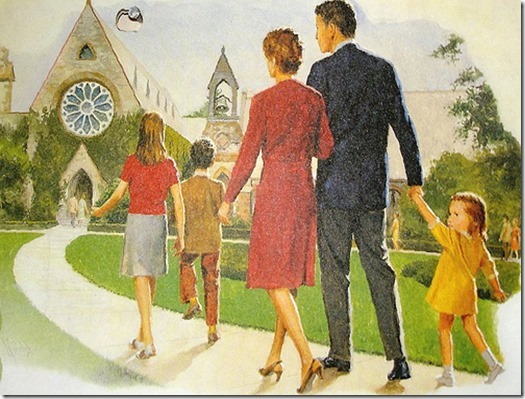 Rather, it was that each and every Sunday we would go together to the house of worship as a family. I would watch my daughter learn how to worship and love the Lord. And I would see how this time, set aside by God, given to us as a gift, drew us closer to the Lord, and closer to each other. Jesus said – “…The day of worship was made for people, not people for the day of worship.” (‭‭Mark‬ ‭2:27‬ ‭GW‬‬). God made the day of worship for you and I! We need it! We thrive in our walk with the Lord and in our love for one another when we honor it! We give God glory and honor His heart when we remember it each and every week. If God set it aside for Himself, and created it for our benefit, shouldn’t we take it seriously? What is more important, our spiritual growth, our worship to the Lord, our health as a family – or that project that can wait, or activity that will still be there the next day? If you have not discovered the awesome joy and blessing of remembering the day or worship – what are you waiting for? Lord, thank you for this wonderful blessing and provision! Thank you for this holy reminder and call! Help me always to “…Remember the day of worship by observing it as a holy day!” Let me rejoice when I go to be in the house of the Lord, to gather together with my brothers and sisters in Christ, to lift our hearts in corporate worship and prayer, and to grow in Your Word!